​Launched in 2013 in Nairobi, Kenya; Afrikoin aims to be the most innovative digital money and financial technology gathering in Africa tackling key technical, adoption, research and regulatory issues that innovators in Africa face. We aim to highlight important technology and business trends on the continent that underpin economic progress across many sectors from healthcare to ecommerce that are underpinned by digital financial services. In the last few years, billions of dollars have been raised to invest in the financial services space targeting Africa from buying and reinventing banks to disrupting and enhancing remittance services, meanwhile the rise of telecommunication led mobile money in Africa in tapping the “underbanked” together with powerful technological forces create huge opportunities in financial services for the next billion consumers on the continent. Afrikoin is not a cryptocurrency, but we are fans of bitcoin and the application of blockchain technology to Africa. 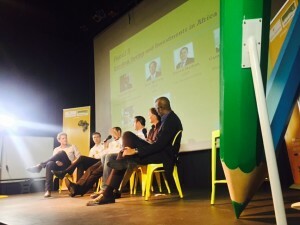 In 2014, Savannah Fund together with Apis Partners brought Afrikoin to Cape Town and in 2015, we brought on Barclays Bank and Thomson Reuters as sponsors for the Johannesburg event whilst also running parallel events in Nairobi, Kenya and Accra, Ghana.